Click Start > Programs > Microsoft SQL Server 2005 > SQL Server Management Studio Express to launch SQL Server Management Studio Express. The "Connect to Server" box shows up. The Server Name field has a default value of "LOCALHOST\SQLEXPRESS". So don't change it. 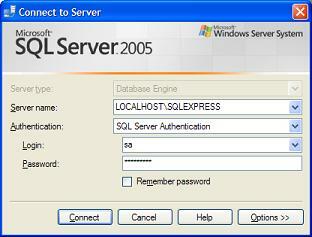 Select "SQL Server Authentication" as the Authentication. Enter enter "sa" as the Login, and "FYIcenter" as the Password. Click the Connect button, you should see the SQL Server Management Studio Express window comes up.